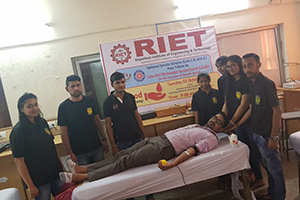 On the Occasion of Gandhi Jayanti (149th birth anniversary of Mahatma Gandhi), 2nd October, 2018, the National Service Scheme (NSS) unit-1 & Unit-2 of Rajasthan Institute of Engineering & Technology, Jaipur organized a blood donation camp in collaboration with Arpan Blood Bank. 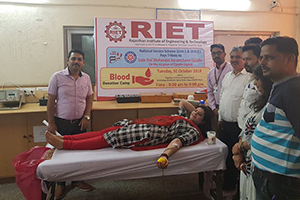 The camp began at 09.30 a.m. with a short inaugural function where in Dr. Arun Mahajan, Medical Officer In-charge, Arpan Blood Bank and his five members team was given a floral welcome. Dr. Arun expressed his gratitude to the NSS unit of the college for its continuous endeavor in this regard. He also stressed on the growing need of blood in the state and commended the young volunteers for their noble act. 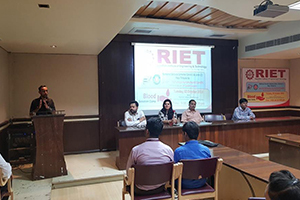 The Camp was inaugurated by Prof. (Dr.) Saroj Hiranwal, Principal, RIET, Prof. (Dr.) Sachin Sharma,Vice-Principal, RIET, Prof. Kapil Dev Sharma, Dean( Academics & Administration),RIET & Mr. Dinesh Swami, Assistant Professor & NSS-Coordinator, RIET by Donating Blood . 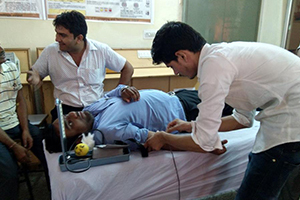 200 volunteers came forward to donate blood during the camp which included teaching & non-teaching staff, students & non-student donors. 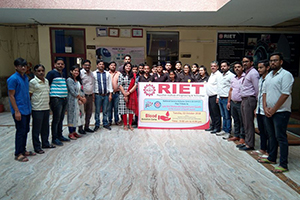 In this camp Overwhelming number of Volunteers of different college and department also has participated with Vivacity.